GPAT 2019 Result- NTA to release GPAT result on 06 Feb 2019 @ ntagpat.nic.in. Those who appeared will be able to get GPAT result 2019 and scorecard. Candidate will be able to check the status of exam soon. Test takers will be able to download GPAT result 2019 online through login details. We will provide a link to view scorecard on official portal or readers can directly check their result through the direct link provided below. 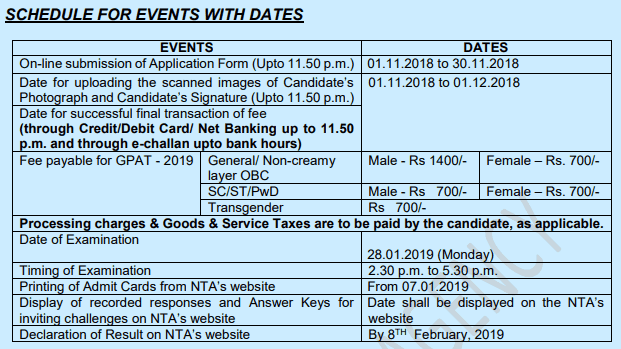 After the release of the result, NTA will announce the GPAT merit list 2019 in PDF format in which it holds, candidate name, roll number, rank scored, and total marks. After the release of GPAT result 2019, AICTE approved universities and institution will call student for admission. 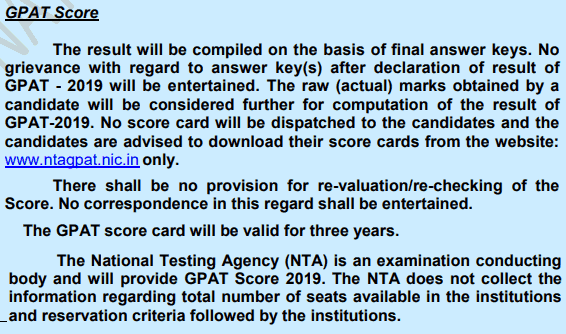 Answer key for the GPAT was released by NTA on 1 Feb 2019 and open objection window for correction. In the article we will explain all about the result, how to download GPAT scorecard online, important dates of GPAT exam, things mentioned on the result, points to remember. 2 How to Check GPAT Result 2019? 2.1 How to Download GPAT Score Card 2019? 4.1 What After GPAT 2019 Result is published? GPAT All India merit list along with result is scheduled to release on soon. However, there is speculation of it to release on 5 Feb as per many NEWS sources. Graduate Pharmacy Aptitude Test is nation level examination for entry in various courses in Masters of Pharmacy (m>Pharma). GPAT scorecard 2019 is asked by the AICTE approved universities for admission. Name in the merit list will be displayed based on a rank score by the candidate. If candidate has the same score then rank will be the same then it will display in an alphabetical manner. In case of Tie Breaker, same marks for GPAT 2019 the candidate will get same rank and name display in name alphabetically in ALL India merit list. How to Check GPAT Result 2019? Click on Button saying ‘view result’ in dark pink color. If details are correctly filled, the result will be displayed on the new screen. How to Download GPAT Score Card 2019? Appeared candidate will be able to download their scorecard after few days of announcement of result. The only mode of download is online and no offline publication and individual post/email will be sent of it. GPAT 2019 Score Card validation period is three year. It will be accepted by all the participating universities, institution and colleges approved by AICTE. On clearing the exam, scorecard of the candidate says that they are qualified for scholarship and admission to Master of Pharmacy. What After GPAT 2019 Result is published? Candidate can apply for the M.Pharmacy course at more than 1000 participating colleges. Students have to note that after the declaration of result NTA will not do any counseling or admission procedure. All the admission will be done at the college/university level. Therefore candidate has to first make a list of desired colleges and then one by one apply individually for the admission round. Each college will display there own Cut-off marks of GPAT score 2019. After which qualified students have to apply for next round of admission. The date mentioned is subject to change as per discretion of NTA GPAT authority. The next round of college admission is counseling. GPAT 2019 counselling will take place as per schedule of individual universities/institutions. On the counselling day, candidate has to take an important document for verification. It is very important to report at the document verification center to secure a seat in college. Hope you have understood the procedure of GPAT result 2019 and how to get a scorecard. In case you have a problem with it, you can comment below your problem and our team will be able to find a solution ASAP.